This shop has been compensated by Collective Bias, Inc. and its advertiser. All opinions are mine alone. #ScrubSeason #CollectiveBias . Read my disclosure policy here. 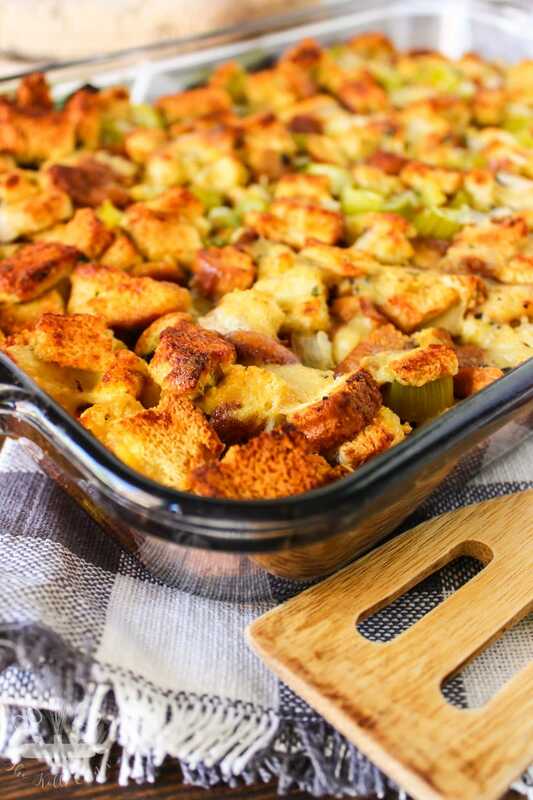 This Potato Bread Stuffing recipe is a must have for all holiday dinners. 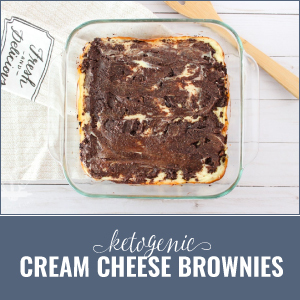 Savory and mouthwatering, it will have even the pickiest of eaters asking for seconds! When my husband and I first moved away from our families, we started a short lived “friendsgiving” tradition with two of our closest friends. They would drive down to spend a few days with us at Thanksgiving before venturing further to see their families. 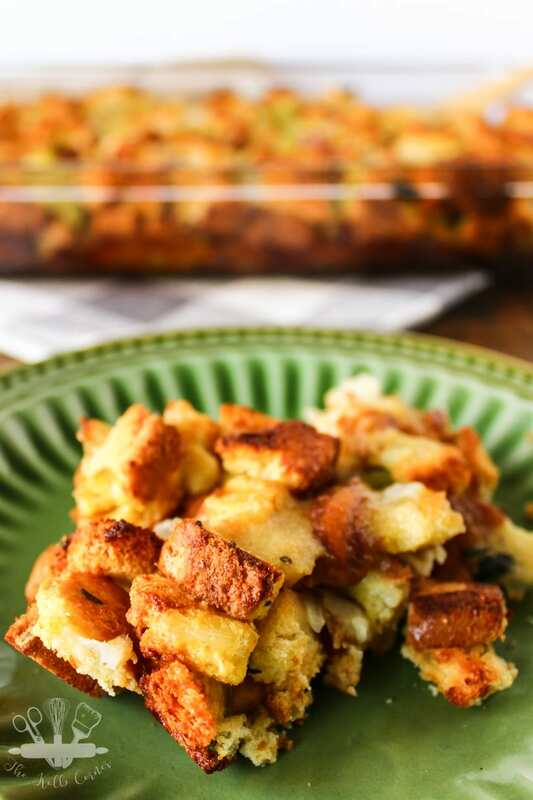 The first year we enacted this tradition, my friend made Potato Bread Stuffing. Now, let me be honest. Up until then, I HATED stuffing and dressing of any kind. There was something about the mushy texture that I could just never get on board with. 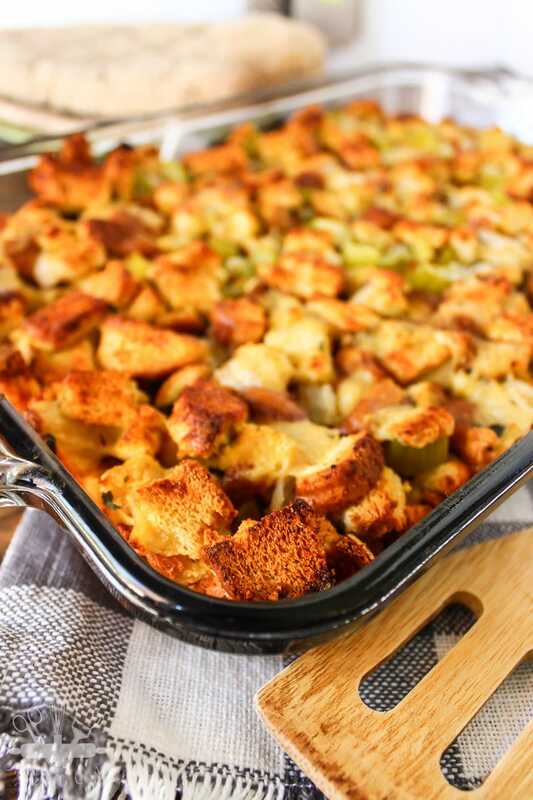 Well, being the adult that I am, I decided to give her potato bread stuffing a try, and boy was it amazing! There was nothing soggy or mushy about the bread in this recipe, and to this day I am convinced it’s because of the potato bread (I could be dead wrong). Either way, I have been making her recipe for the past several years since we no longer live close enough to get together. Of course I have tweaked her recipe a bit to fit me and my cooking tastes. 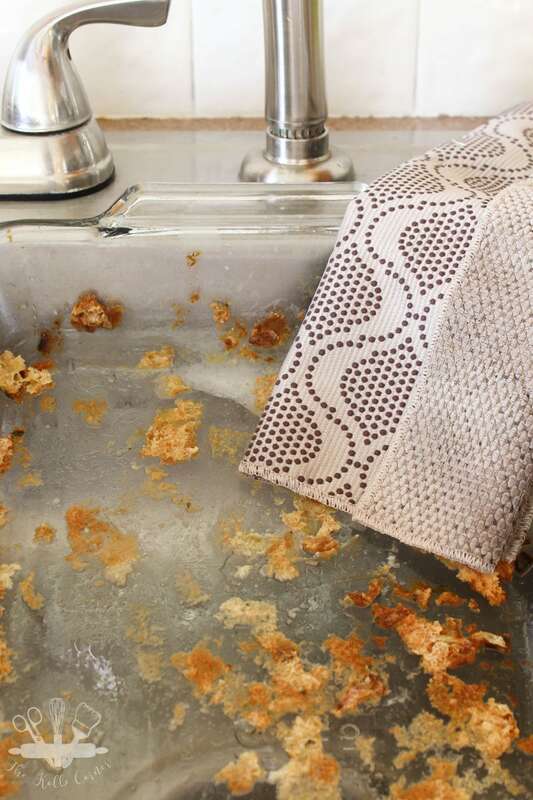 With any great baked dish though, comes the hassle of cleaning it afterward. And this recipe is no exception. The worst part of making the potato bread stuffing is trying to scrub off the baked on food later. Even after letting it soak for awhile, I still have a hard time. And let’s be honest, we have all been to the point of using our fingernails to scrape off some of the most stuck on food. 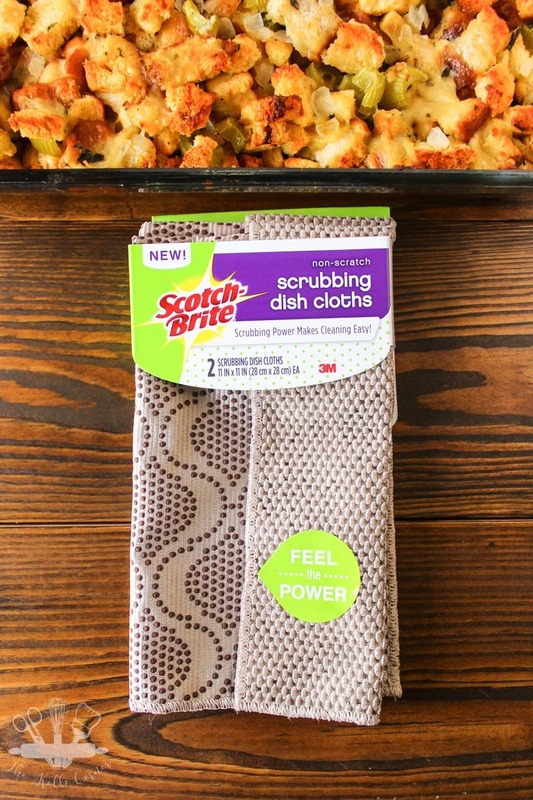 Luckily though, I stumbled across a new product from Scotch-Brite®Brand when I was at Walmart getting the ingredients for the potato bread stuffing–the new Scotch-Brite® Scrubbing Dish Cloths. You can find them in the cleaning aisle next to dish soaps, with the sponges. 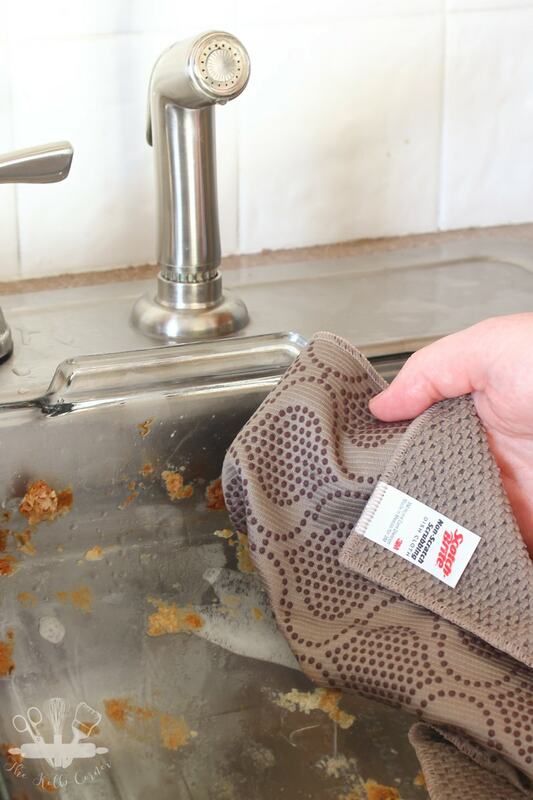 The new Scotch-Brite Scrubbing Dish Cloths take cleaning to a whole new level! It’s the dish cloth. Reinvented. One side has their scrubbing dots technology and the other side is a textured fiber dish cloth, allowing you to have the scrubbing power of a sponge and wipe-ability of a high quality dish cloth. Plus the new Scotch-Brite Scrubbing Dish Cloths come in 5 different colors so you can find the right one to match your kitchen! 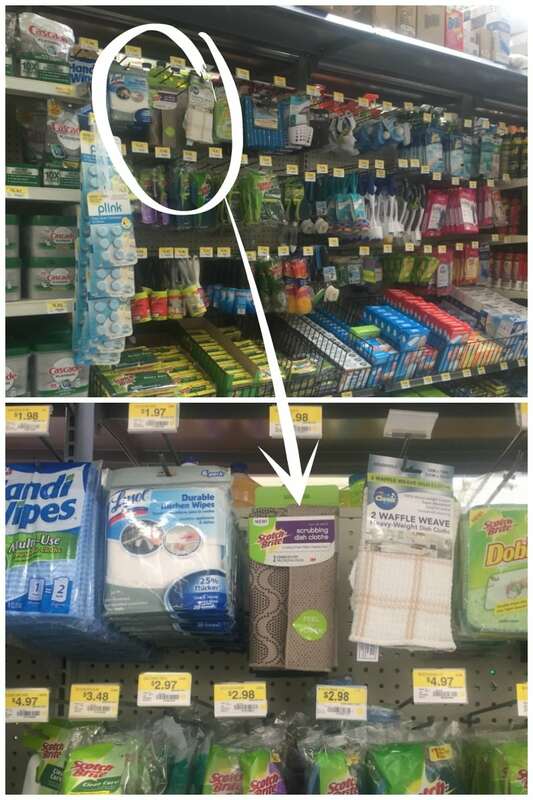 Save $1 on any two Scotch-Brite Products (Scrub Sponges, Lint Rollers and Scrubbing Dish Cloths). These dish cloths really made clean up so easy! The scrubbing dots helped scrub away the stuck on mess, while the textured cloth side took the place of my regular old dish cloth. One item for the job of two! 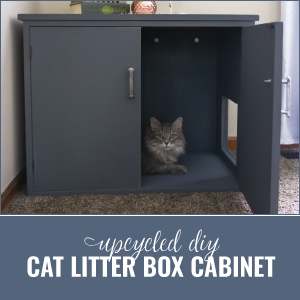 Plus, there was no need to get my fingernails involved. 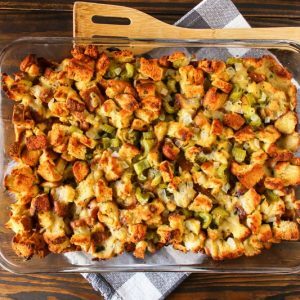 Since Scotch-Brite Scrubbing Dish Cloths have made clean up easier for me, there’s no reason why I can’t make this potato bread stuffing recipe year round. Right? ***The potato bread needs to be stale and the best way I've found to achieve this is to cube the bread at least 24 hours before making the dish, then leave out on a cookie sheet to harden up. If you are trying to speed up the process I have cubed the bread, placed on a cookie sheet and placed in a warm oven (200 degrees) for about 30 minutes watching carefully. Preheat oven to 375 and lightly grease a 9x13 baking dish. Set aside. In a large skillet, melt 1 stick of butter over medium heat. Add diced celery and onion, sage, thyme, rosemary, salt and pepper and cook about 5 minutes until celery and onion start to soften. Add in chicken stock and bring to a boil, then reduce heat and simmer while you prepare the next step. In a small bowl, slightly beat 2 large eggs. Stir in chopped parsley. Add potato bread to a large bowl, then pour egg mixture over top and toss to combine. Pour in vegetable mixture (1st section) and toss to combine. Transfer to prepared baking dish and dot the top with butter. Cover with foil and bake for 30 minutes. Uncover, and bake an additional 30 minutes, or until top is golden brown. 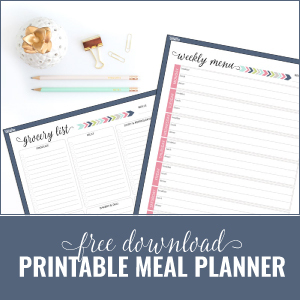 Craving even more recipes and cleaning tips? Check them out here. 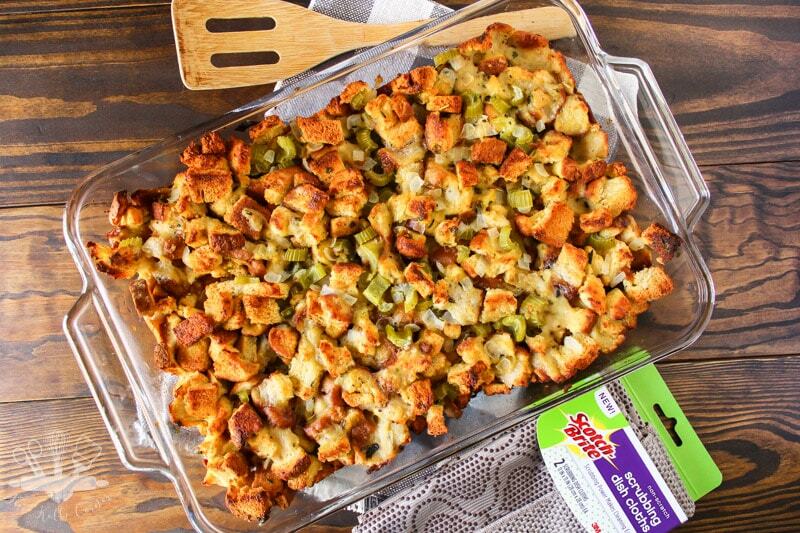 I don’t usually eat stuffing, but this looks so good. Saved this recipe for later! how much bread is 16 cups in loaves?